For the past ten years, M & R Liquors has celebrated the Holiday Season with a hand picked selection of 12 wines, chosen with festive celebrations in mind. Ranging from deep red to bubbly, you’re guaranteed to find a wine to pair with your holiday party, dinner, or cocktail hour. The ladies of M & R – Jessica and Patti – and I sat down to Burton’s take out (delicious!) and a sampling of all twelve last week, in order to get into the spirit of the season and bring you, dear reader, a recap of each and every delicious blend. 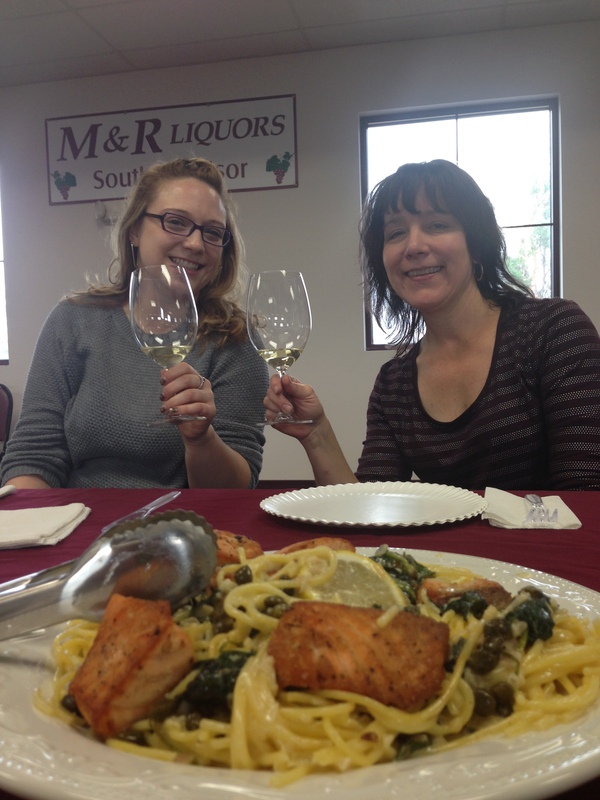 Pictured left to right: Jessica Rounseville and Patti Paul of M & R. Pictured foreground: delicious salmon pasta from Burtons. 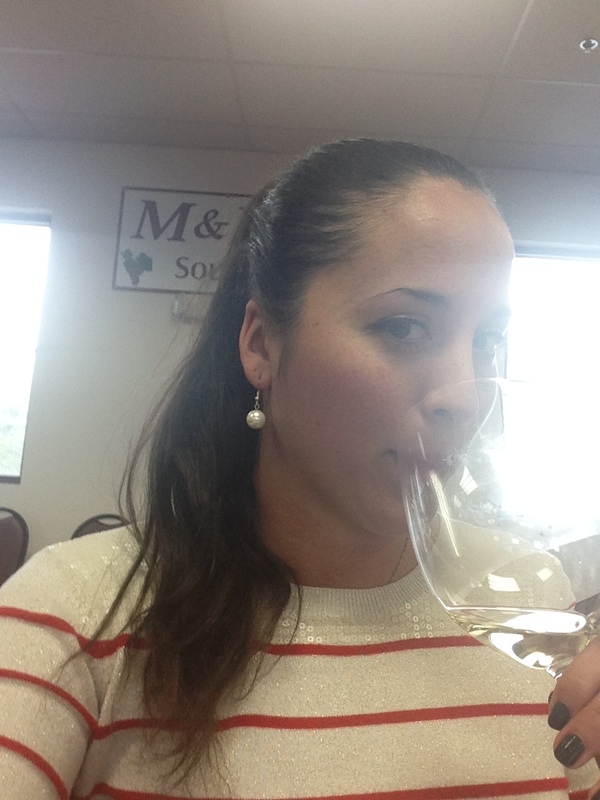 There are some things more festive than a holiday sweater and a wine tasting. But I’m not sure what they are. I’ll get back to you on that. “A Partridge in a Pear Tree:” Charmes D’Magnol Bordeaux Blanc 2012 ($14.99) Why start with a Bordeaux Blanc? Well for starters, its high acid content makes it a wonderful wine to pair with appetizers. French wines are almost always designed with a food pairing in mind. This particular blend hails from Bordeaux: a region well noted for its excellent grapes. It also boasts an impressive 88 points, courtesy of the Wine Enthusiast. Recommended food pairing: goat cheese and crostini. “2 Turtle Doves:” Chateau Maligny 1st Cru Chablis Fourchaume 2011 ($34.99) As with many wines on this list, the folks at M & R have selected some of their favorites which carry, quite frankly, obscure labels – you’re not going to see a whole lot of “Chardonnay” on the label here, for example – although there are 100% Chardonnay grapes in the wine! The concept is to challenge the palate with new and exciting This particular light and creamy wine hails from the Chablis vineyards, on a small family owned and operated estate. The flavor would pair very well with pasta in cream sauce, lobster, or a nice light cheese plate and green grapes. “3 French Hens:” La Perliere Poilly Fuisse 2013 ($24.99) For those who might not know (I certainly did not – until the knowledgeable ladies of M & R clued me in) – “Pouilly Fuisse” refers to a white wine produced in four villages within the Mâconnais region of France. This particular wine has 100% Chardonnay grapes, an excellent mouthfeel with mid crunchy characteristics, and a heavy load of spice and oak on the palate. The spicy aspects in particular make this a great seasonal wine which will make you feel festive as you sip it. Recommended food pairing: roast chicken or turkey. “4 Calling Birds:” Limoux Terroir Les Garrigue – 4 Terroirs 2010 ($19.99) Another wine hailing from Burgundy, this particular blend has a higher acidity and less sugar content than ‘new world’ Chardonnays from Australia and California. There is a high acid content with a beautiful color and clarity, and a smooth creamy mouthfeel in this wine. The fruit characteristics would pair well with a seafood risotto. “5 Golden Rings:” La Perliere Gevrey Chamgertin 2010 ($43.99) Moving from whites to red, we venture into the marvelous world of Burgundy’s Cote de Nuits district. This particular wine is very reasonable priced, hailing as it does from a region that is home to a whopping nine Grand Cru vineyards. The pinot noir grape is harde to work with, and this particular wine is 100% Pinot Noir and executed brilliantly, with a nice smoky aroma and a smooth and full bodied finish with a bright hint of blackberry and oak. It would pair brilliantly with a salmon dish, or a nice steak filet. “6 Geese a Laying:” Rubus Barossa Shiraz 2012 ($18.99) Leaving France for a minute, we venture to Australia to sip one of my favorite wines on the list. It’s a deep, dark, bold red with a rich fruit flavor and just a hint of spice. Hailing from Australia’s top wine producing region, this wine garners a total of 90 points from Wine Spectator. It’s a bold, smoky red which would fit nicely with a roast at Holiday dinner. “7 Swans a Swimming:” Double R Ranch North Coast Red Blend 2011 ($18.99) As a member of the Wine and Spirits Guild Group, M & R Liquors has the opportunity to produce its own blends throght it’s “Double R” label – named for Roy Rounseville, one of the founders of the company. This is a classic California “big red” – a blend of eight grapes expertly capturing a berry palate with a many spicy layered notes. A very popular wine in store, the recommended pairing for this is roast turkey. “8 Maids a Milking:” Block 478 Napa Valley Cabernet 2012 ($19.99) Another big California red, this wine is new to M & R this year. It’s a boutique blend with a great price point for its execution, with every grape coming from a small, intense 10 acre block to ensure a superb amount of attention to cultivation. A very mature red with a liquorice and pepper palate, this wine is purely expressive of Napa Valley Cabernets. Recommended pairing: flourless chocolate cake. “9 Ladies Dancing” Block 627 Yountville Cabernet Sauvignon 2010 ($28.99) Another block Napa Cabernet, this particular blend can retail for over $160 per bottle – so its another steal at the price point. Its a dense and firm red with a nice crunchy palate and a crisp finish – a premium grape with a sophisticated taste and notes of cherry and chocolate. Again, this red would pair well with chocolate, or a bold protein such as duck. “10 Lords a Leaping” Casarena Reserve Malbec 2011 ($19.99) This is an intensely sophisticated and delightful Malbec, hailing from the Casarena Vineyards near Mendoza, Argentina. It is suberbly balanced and has a wonderfully deep, buttery mouthfeel with just of acid finish and beautiful deep clarity. Drinking this wine, it’s easy to see why Malbec is such a hugely popular and trending blend. Enjoy this wine paired with an exquisite charcuterie board to bring out all the complex characteristics of the grapes. “11 Pipers Piping” Cuvee Papale Chateauneuf Du Pape 2010 ($39.99) Ah, a cuvee. Known for its excellent, this one boasts a whopping 91 points from Wine Spectator. The “chateauneuf” blend always has 13 different grapes in it, with one or two whites in the blend. This is an excellently sophisticate wine with a notes of plum and graphite, and a nice subtle spice to finish its nose. The grapes mesh perfectly into a buttery and concentrated red which will pair very well with a lamb dish. Very highly recommended. “12 Drummers Drumming:” Double R Ranch Sparkling Brut ($24.99) we paired this Brut with dessert and enjoyed its bubbles and fresh palate, with hints of vanilla and brioche. A traditional champagne blend from Sonoma, the grapes are crisp and selected in the traditional Methode Champenoise. This would also be a terrific choice to toast in the new year!